The Bee Gees have certainly contributed to some medical disasters over the years - the odd platform shoe malfunction, a schoolyard beating here and there, not to mention testicular injuries when mere mortals attempt to hit those high notes (yikes!). 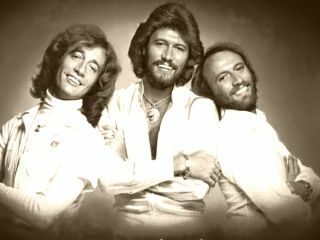 Researchers at the University of Illinois College of Medicine found that the Bee Gees' song Stayin' Alive can help people in cardiac arrest, er, stay alive - because the song's tempo, at 103 beats per minute, provides the perfect rhythm for performing CPR. The American Heart Association recommends 100 chest compressions per minute, and the study showed that Stayin' Alive made a huge difference in classes where students were having trouble keeping the right beat while practicing on mannequins. Dr. David Matlock headed up the study by having 15 doctors and medical students perform chest compressions on dummies while listening to Stayin' Alive - and found that the song had a dramatic impact. Five weeks after practicing with the music playing, the doctors and students were asked to perform CPR again on dummies by keeping the song in their minds, and again they kept up a good pace. "The theme Stayin' Alive is very appropriate for the situation," said Dr. Matlock. "Everybody's heard it at some point in their life. People know the song and can keep it in their head." As of yet, there are no findings on how The Bee Gees' How Can You Mend A Broken Heart affected CPR procedures.